Off-road riding is a great family activity. It’s a chance for young people to learn new skills and develop self-confidence, and parents find exploring the out-of-doors a wonderful way to spend time with their kids. Along with the fun and adventure, off-roading involves special responsibilities for parents and young people. Even the smallest ATV is relatively heavy and should be respected and never treated like a toy. So is your youngster even ready to ride? Because parents know their kids best, you are in the best position to decide when your son or daughter is ready to ride. Riding readiness can vary widely from one person to another, and there’s no sure way to determine whether a given boy or girl is ready. However, the following guidelines can help you reach a decision. To safely ride off-road, a person must be large enough and strong enough to easily reach and operate the controls. To see how a young rider measures up, first have him or her sit on the vehicle you are considering. Are their arms long enough to turn the handlebars all the way to the right and to the left? Are their hands big enough and strong enough to work the brake levers, the throttle, and other hand controls? Can their feet comfortably reach and operate the brake and other foot controls? Next have the young person stand up on the footrests while he or she holds onto the handgrips. See if there is at least three inches between the vehicle seat and the youngster’s seat of the pants. A rider needs at least three inches of clearance so they can rise off the seat for comfort, balance, and visibility. Off-road riders need good hand-eye coordination, agility, and a sense of balance. If your son or daughter is good at riding a bicycle, skateboarding, playing baseball, or soccer, he or she will probably do fine on an ATV. Because riders need to think quickly and react appropriately, it’s important to ask yourself if your youngster analyzes problems and comes to logical conclusions. Do they understand the relationship between unsafe actions and consequences? Do they follow instructions? Do they understand that people have different abilities and accept their own limits? Try to be honest as you evaluate riding readiness. If a young person is too small, has poor coordination, takes unnecessary risks, or doesn’t make good judgments, they need more time to mature before riding off-road. Before a youngster rides off-road, you'll need to provide them with a few basic safety items, and make sure they wear them on every ride. The most valuable piece of safety equipment is a high-quality motorcycle helmet with a label showing approval by the U.S. Department of Transportation (DOT). The helmet should also fit snugly and be securely fastened before riding. Other important safety wear includes goggles, sturdy boots, gloves, long pants, and a long-sleeved shirt or jacket. How Much Training and Supervision Will They Need? Providing good instruction is a key responsibility of parents. As a first step, you should read the owner’s manual together with your son or daughter, and make sure he or she understands the instructions and cautions. Next will come a period of hands-on training and practice. Whether you serve as a primary instructor or arrange for a qualified teacher, plan on attending all instruction and practice sessions. This may take some time, but no one is better able than you to evaluate your child’s progress. Remember, even after young people become skilled off-road riders they still need adult supervision on every ride. If you can’t personally ride with your youngster, you’ll need to make sure a qualified and caring adult will be there. 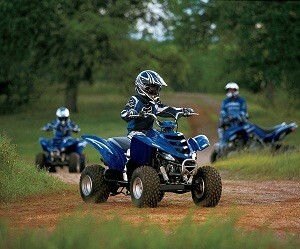 ATVs with an engine size less than 70cc are recommended for youngsters 6 years or older. ATVs with an engine size 70–90cc are recommended for youngsters 12 years or older. ATVs with an engine size greater than 90cc are recommended for people at least 16 years old. In a voluntary agreement with the government dating back to the late 1980s, the dealers, in fact, can’t knowingly sell an ATV to a family that plans on disobeying the above age/engine size limitations. However, common sense tends to muddy the waters on this particular topic. On the one hand, even though the child is of the recommended age for a particular ATV, not all youngsters have the strength, skills, or judgment needed to operate the vehicle safely. On the other hand, there are many teenagers under 16 who, due to their size and maturity, are fully capable of safely operating ATVs larger than 90cc. The final decision of course is up to the parents and, as with any kind of risk sport, safety should be the number one priority when choosing the proper-sized ATV for your child. If you are buying a gift ATV for your child, consider completing an ATV Rider Safety Course before taking delivery of the youth model, and be better prepared to supervise your child. (Your child may take the course before or after you bring the ATV home). Another option is to take the ATV Rider Safety Course that is offered by the ATV Safety Institute (ASI). Courses regularly take place at various locations throughout the country. If you are buying a new ATV, your child may be eligible for free training; otherwise there is a modest fee. During the course, riders will learn how to do a proper pre-ride inspection, ride in a variety of conditions, and negotiate obstacles. You'll also get the latest information on protective gear, local laws about ATV use, and finding places to ride in your area.